It works pretty well - print quality is significantly better with the shroud, especially when printing single small items. Before using this I'd have to print multiple copies of a small item at the same time, otherwise it would get melty looking. I've also found this compatible cooling fan setup someone else made: [www.thingiverse.com] I haven't tested it yet - I'm waiting on some wiring so I can control the print cooling fans separately from the extruder heat sink fan. Thanks MostTornBrain, that second one looks like what I was looking for. I tried another version of the first one that did not fit very good. I think I will print the first one and install to help printing out the second one. Looks like the dual shroud version uses the same size fan that is on the extruder? I see you a using a printed cable chain. What is the blue rectangular shape behind the extruder? Is that the extruder mount? The blue rectangle is a mount for the cable chain. It clips onto the stepper motor - no screws needed, so it is easily removable. It's a modified version of this: [www.thingiverse.com] I printed the horizontal version but used a connecting link from the chain model rather than one that sticks up so high. Regarding the 1st fan shroud, I custom designed it to fit my Prusa Guru, so it should fit a lot better than other ones that were deaigned for other printers. The fans are the same size as the extruder one (40mm 12volt). I bought mine from ReprapGuru.com. The nice thing with their is they come with a very long cable. Edited 2 time(s). Last edit at 01/27/2017 12:03PM by MostTornBrain. there is a way to use the reprap in Microsoft 3D builder. here is the link How to use RepRapGuru in Microsoft 3D builder. 2. is there an instruction on how to use the LCD controller? Hey, sorry I went silent. Blew up a driver board so been catching up on other things. Printed out the fan shroud but it fail on the upper horizontal face as it could not span that gap. Took the model and split it to 2 pieces then glued them together, looks great. The tried printing a new fan shroud in one piece but still could not span that gap. Ordered some new drivers and other spare parts including some extra fans. Thanks for the excellent suggestion on getting them from RepRapGuru as I had not thought about having them already terminated and to length! I am going to print that double cooling fan set-up you linked to once I get the printer back up and running. Kind of weird. I had smell some magic smoke one day but could not identify where it was coming from. A few days later I was looking at my print in process from the backside and I could see a small waft of smoke coming forming the circuit card stack. Pulled the drivers and found the y axis driver had a trace that was failing. Being in a hurry, I then mispinned the drivers when I replaced them and fried another driver! Hoping that is all I fired. Got an extra ramps board just to have but did not get another Arduino. I got the PrintinZ print bed sheet . Looks excellent! Got a nice thickness to it that should hold pretty flat during cooling. I bought a sheet of PEI that improved print adhesion tremendously but it is only .8mm thick so I did see some slight warpage during cooling on larger/longer parts. The PrintinZ sheet is 4.5mm . Bought a roll of glow in the dark filament as my daughters what a bunch of things printed so I got a hardened steel nozzle reeady to replace also. I will get on that this weekend as we have some projects to get printing. I fixed the stepper drivers that I fried. Now, ll of the steppers move, but when I print, 2 things happen: The X and Y axis don't go all the way to the edge of the 200*200 MM bed, even though the settings show that the bed is that size, as well as say that the axis are all the way there. I checked the voltage to make sure that the stepper were simply getting enough voltage, and they are. Second, the heated bed doesn't turn on at all. ideas? I have been able to get prints out of the machine, but only by scaling them on the Y and X axis by 25% because the 10 mm cube I printed measured 7.5mm/7.5mm/10mm. I've had this printer for about a month and a half, so I'm beginning to discouraged. Edited 1 time(s). Last edit at 02/04/2017 01:44PM by Tyborg. I fixed the stepper drivers that I fried. ... I have been able to get prints out of the machine, but only by scaling them on the Y and X axis by 25% because the 10 mm cube I printed measured 7.5mm/7.5mm/10mm. I've had this printer for about a month and a half, so I'm beginning to discouraged. If your X and Y is off by 25%, then increase the first 2 numbers by 25%, re-download the firmware, and see if things seem more accurate. For example, if the value for X and Y are both 80 (like they are in the above example) change them to 100. You could also test various values using the M92 G-code command (without having to download new firmware) to see what values give you the most accurate X and Y positioning. Here is mine after about four months of use. Made a few mods. Well, I am back up and running. Had to replace all stepper drivers, Ramps and Arduino, oh well, live and learn. Note to self - PAY ATTENTION DUMMY!!! Thanks for posting up that question Tyborg as I encountered the same problem originally and also when reloading everything. Funny how quickly I forgot everything I had tweaked. The settings in the RepRap_Guru_Marlin V2 zip file for the software are not correct. As you mentioned, x and y are set at 80 - should be 100. The z axis setting is correct at 4000. I also found the extruder value to be off. It is set at 90 in original software and I measured 90 when commanding 100. I set mine at around 96 so it is just slightly under extruding. Edited 1 time(s). Last edit at 02/06/2017 10:50AM by JB01245. Thanks so much for the fix. You can actually do this, as I found out, on the printer using the LCD screen and buttons. All I need to do now is set the extrusion steps per MM to 95, not 90, as that is under-extruding. Printed the new cooling ducts last night and pulled them off the printer this morning. They look great. Thanks again MostTornBrain for pointing me to them. 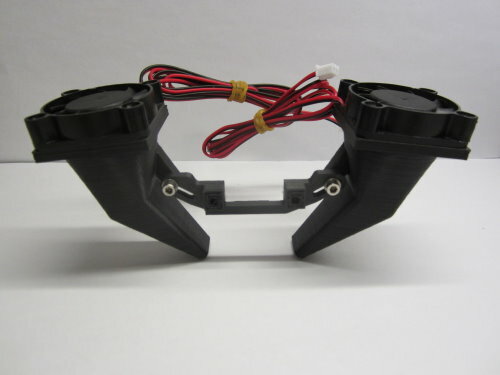 I also found this remixed bracket for the dual fan ducts - FolgerTech Dual Fan Mount I have attached a picture of my dual cooling fan set-up that is ready to be installed. ISmith1437 - Thanks for joining the forum and starting the group on Thingiverse! Hoping we can use the forum to build of each other knowledge and experience. I had searched for a RepRepGuru group earlier and did not find anything. Nice collection of bits to get started with. Nice x -axis tension block design. I just tightened by x-axis belt as after about 2 months of printing it had become stretched a little bit. What a pain that was. Now I want to print and use your design! Well. Everything was going great for about a week. We completed several small print jobs and were getting familiar with different materials. Then the heated bed stopped reading the temperature. It just reads 0. The LCD says it knows when a target temperature has been assigned, but nothing happens. Motors and other sensors work just fine. I can heat and cool the extruder just fine. This is my first 3D printer and without the instructions I have very little idea what I'm doing. Sounds like there is a loose connection in the thermistor (bed temperature sensor). Check the two thinner wires coming from the bed - if you've been printing a lot, the back and forth motion of the bed can break the wire at the solder joint on the heat plate. If that happened, you'd need to resolder them. Also, check where those wires plug into the RAMPS board - maybe something bumped the connector loose. CutterNorth, please don't post the same/similar questions across several subjects. As I said in response to your post on printing problems, what printer are you using? The advice or answer to your question depends on this information if you want an accurate reply. Right. Sorry. Everything is connected correctly and securely. Here is the information on my printer. I really wish someone could help you out CutterNorth. I know how it is to be digging on the new printer and then have it go down for a time and not being able to use it. I am brand new to 3D printers also so I have not encountered a heated bed failure yet. Does sound like something to do with the thermistor if you are getting proper voltage to the bed. Have you tried calling RepRapGuru? Based on feedback on Amazon, their tech support is supposed to be pretty good. I posted this in a separate thread but the problem with the X Axis rods is not that they are too long, I believe it is because once you put the bearings in the body of the right side it warps the whole assembly and this causes the precut holes to be misaligned (meaning no longer straight). I think cutting the rods is a huge mistake. It is not easy to drill the holes because once the bearings are in, the drill will try to follow the misaligned hole so you have to actually cut a new path. I was able to finally get my rods in once I forced the drill to go in at an angle but it took many many times. You could try a drill press with the right (X Axis Stepper motor mount) end unit firmly clamped to the drill press bed and slowly drill with the bearing assembly installed and a chrome rod inserted into the bearing assembly to keep from losing the internal bead bearings. Edited 2 time(s). Last edit at 02/18/2017 08:18PM by Simba028. You would do better using a cheapo 8 mm reamer than a drill,allso the rods to not have to so tight you cant push them in the holes, a nice snug fit will do. I don't know... one of the reasons the holes are so deep, I think, is to ensure that the fit is stable and aligned properly as well as eliminating flex. While a drill could could also wallow out the holes I think the reamer would cause more wallowing and leave less meat to hold the rods. You might be right though. You could also insert both chrome rods into the piece before installing the bearings. As tough as it was to get the bearings in first, I am sure it is even harder when the piece won't flex as much with the rods installed. Edited 1 time(s). Last edit at 02/22/2017 01:59PM by Todd Carr.